‘Zweckentfremdungsgesetzes’: one of those crazy German words impossible to pronounce. Lately, it has been a topic of debate in the German capital as it can be responsible for huge fines against people renting out their apartment on AirBnB. It regards the ‘misappropriation’ of living space, or to say, the use of living space for a purpose other than living. In this way, the city of Berlin is trying to fight its increasing shortage of affordable housing. It tries to fight not only the rental of apartments on AirBnb or other alike sites, but also apartments staying empty for longer than 6 months or the transformation of apartments into commercial spaces. A license issued by the city hall is now required if you want to rent out your place to tourists or other temporary guests. This new law, implemented already in 2014 but allowing for a transition period of two years, came in to effect on the 1st of May and has sparked a variety of reactions since. Of course, AirBnB is not happy about it and has criticized the Berlin government for fighting against “regular locals who occasionally share their homes to afford living costs in the city they love” (Julian Trautwein, Spokesman of AirBnB, 2016). However, also locals and some of Berlin’s neighborhoods have expressed doubts as to the practical application of the law, which remains vague. For example, does this mean that you now risk a fine which can go up to 100.000EUR simply for renting out your house for some weeks, while you are enjoying your holidays somewhere else? Until today no clear answer has been given to this. Photo Host with Pride (Flickr) Licence: CC BY-NC-ND 2.0. AirBnb sponsors San Francisco Pride. The law was even brought to court as some people were questioning the constitutionality of it. Not surprisingly these people were themselves propriety managers and the court ended up confirming the validity of the law a couple of weeks ago, pointing out that the new regulation is justified considering the situation of Berlin’s housing market. 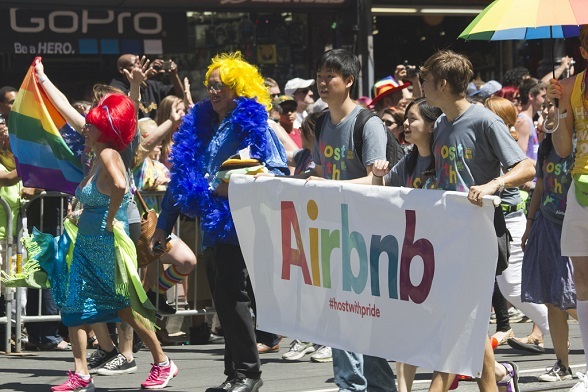 What is it about Airbnb that is causing so much debate all over the World? Basically, it is similar to the issue with Uber, and with all companies which are the driving force behind the so-called sharing economy: there is no regulation. The same way Uber is a nightmare for any taxi driver, AirBnb is a nightmare for any urban planner, and for any city dweller for that matter. While urban planners are busy developing the city and its areas in a way that keeps the availability of affordable housing around the city under control for the upcoming years (and even decades), houses in the nicest neighborhoods are kept only to be rented out to tourists. Most people living in one of Europe’s biggest cities today will know someone who has moved to a new place, while keeping the old apartment to make some extra money renting it out to tourists, students or expats. 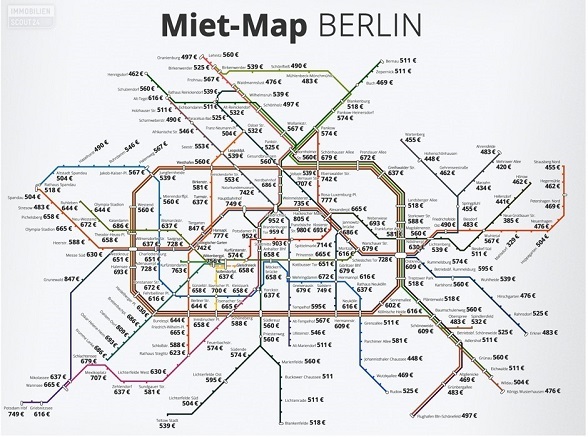 While the rent of a one-room apartment in Berlin varies, on average, between 500EUR and 800EUR per month (within the ring-bahn) , the average cost of an AirBnb unit in Berlin is 55EUR per night. Start counting your profit. Besides that, AirBnB is a perfect platform for individuals or business operating at a commercial level when it comes to renting out apartments to tourists. For example, in Berlin 10% of the users rent out more than one apartment or room. The top 10 users when it comes to number of listings per user are responsible for a total of 281 offers . These figures indicate clearly that it is not only about ‘locals who occasionally share their home in the city they love’. It is the essence of all the sharing economies which have been booming in the last years: to find someone interested in something you do not need or something you can share, while cutting off all the intermediary parties and turning the deal into something personal, simple, and (usually) cheap. Whether it is a room, a car, clothes, furniture, art, a skill or a service – it is possible. There is an ongoing struggle between AirBnb and city governments; not only in Berlin, as well as in Barcelona, Amsterdam, New York, and San Francisco – the company’s own hometown. However, except for the hotel industry no one can be against the essential idea on which AirBnB was founded – to rent out some free space in your own house to travelers like you and me. To make some extra money by turning the spare room in your apartment into a bedroom for people wanting to spend some time in the city you live in, or to cover your costs while being away on holidays. Many travelers would prefer a cozy apartment in a local neighborhood instead of a dull hotel room somewhere in the touristic centre of the city. It is the essence of all the sharing economies which have been booming in the last years: to find someone interested in something you do not need or something you can share, while cutting off all the intermediary parties and turning the deal into something personal, simple, and (usually) cheap. Whether it is a room, a car, clothes, furniture, art, a skill or a service – it is possible. Photo courtesy of AirBnb vs Berlin License: CC BY-NC-ND 2.0. 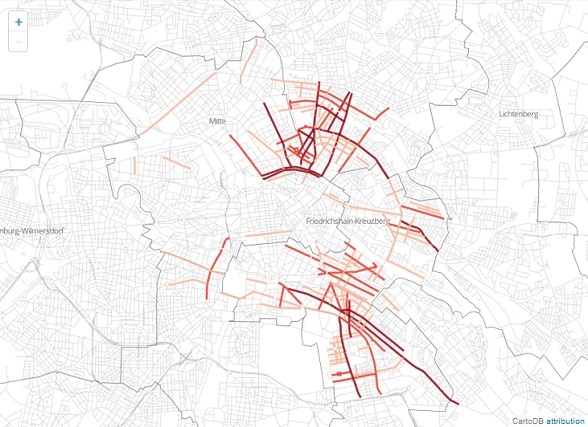 The map shows all “Airbnb Streets” of Berlin, i.e. streets with more than 20 Airbnb offers. Darker colour indicates more offers. Some argue that Berlin is acting against the essence of sharing economies by implementing a law that forbids renting out people’s own apartment to tourists or others alike. Sharing economies are being undermined by their own success. The platforms which form the driving force behind such sharing economies are being used not only by locals who would like to share something with others, but by big business seeking profit and enjoying the lack of legislation and requirements . This phenomenon represents a growing grey area when it comes to legislation and control. Brian Chesky, one of AirBnB’s co-founders, once said that “there were laws created for businesses, and there were laws for people. What the sharing economy did was create a third category: people as businesses”. Designing laws for this third category has shown to be a challenge. While I am writing this, you can still quite easily book a full apartment in Berlin for you upcoming weekend away. AirBnB states that it is not responsible to assure that its users are compliant with local laws (although notifying all users actively about local legislation which could possibly intervene with the business) and for the authorities it is a complex and vague task to identify who is renting out their apartment to tourists and who is not. After all, to what extend can you control what people do with their own houses? Nonetheless, local governments cannot allow themselves to stand on the sideline. According to figures released by the city of Berlin, it is estimated that around 1.000 fresh apartments for long-term will appear on the market in the upcoming months and that this trend will be ongoing. On long term this might mean an increase of 10.000 available houses on the market. Although this will not be a radical change in a city as big a Berlin, it is a welcoming development. All eyes will be on Berlin to see how this law will impact the development of the housing situation. If effective, more cities might follow. If not, a different approach might be tried, for example the one currently in place in New York where people are allowed to rent out their place only for a limited time per year. It is a process of trial and error, due to the existence of unknown territory. As I said, it will be an ongoing struggle until a common ground between the interests of the participants in sharing economies and the interests of local governments is found. And maybe one day sharing economies will be the rule instead of the exception.